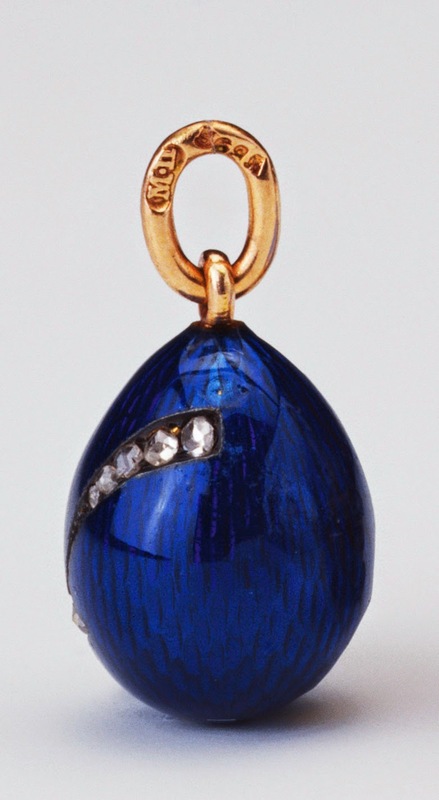 Here comes yet another one of Fabergé's famous egg pendants. This one was made by workmaster Mikhail Perkhin, sometime between the years 1896 and 1903! As I love the night and the stars, I feel this one would fit perfectly on a chain around my neck! The little gold egg is covered in night-blue enamel over a guilloché ground. It is also decorated with rose-cut diamonds in a falling star pattern. It's dimensions are 0.6'' x 0.5'' (1.6 x 1.2 cm), and it was acquired by Queen Alexandra. It now has it's place in the Royal Collection.